Are you happy when you’re high? Depending on your interpretation of ‘high’, that may or may not have the same connotation to you as others. Being high can stem from a myriad of sources. It can stem from the consumption of alcohol, tobacco, or illicit drugs. It can also stem from a more natural source. If you seek a natural high, one that’s unencumbered by a false sense of spirited motivation, you can experience the true sense of happiness. The challenge becomes where to find, corral and keep that sense of happiness so you can call on it when needed. No one can be on a natural high all of the time. But, if you evoke it without false insemination, you are on your way to unlocking one of the keys to a successful life; that key is happiness. Here’s the point. One day none of what you think is important will be important. None of the challenges you have will be important either. That day will occur when you’re no longer able to influence your thoughts or those of others. That’s the day that you will have transitioned from this life into another realm of being. So, make yourself as happy as you can, while you can. And, when you can’t make yourself happy, make someone else happy. That act will come back to you in the form of happiness … and everything will be right with the world. When you negotiate, be extremely protective of your mind (i.e. the way you think and feel) and your thought process. If you’re able to contemplate happiness in the face of adversity, happiness may not appear to be that daunting. That will allow you a freer thought process, one that’s not encumbered by dread. It’s the thoughts fueled by negativity that causes our negotiation efforts to become derailed at times. The thought of being happy can keep your thoughts on the right track. It may sound quirky but, try it. Act happy when experiencing dread during a negotiation. At a minimum, it will cause the other negotiator to wonder what’s occurring. That may give you the time needed to assemble a more robust rebuttal. Think happy thoughts, be happy. You really don’t have anything to lose and you might discover something that’s unique about your negotiation abilities than you previously realized. 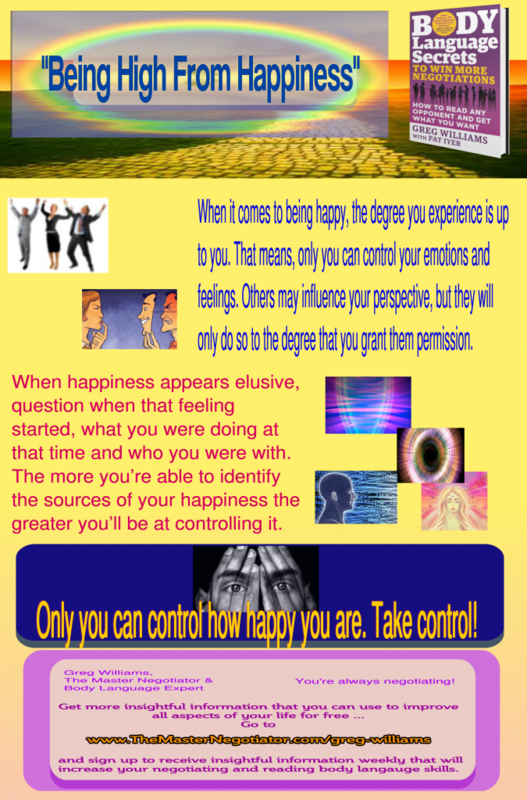 The post “Being High From Happiness” – Sunday Negotiation Insight appeared first on The Master Negotiator & Body Language Expert.